When it comes to visual communication in the work place, floor markings are one of the most popular tools. Marking floors is an easy and unobtrusive way to convey information to improve efficiency and safety. When facilities decide to use floor markings, it is smart to learn about all the different options available. 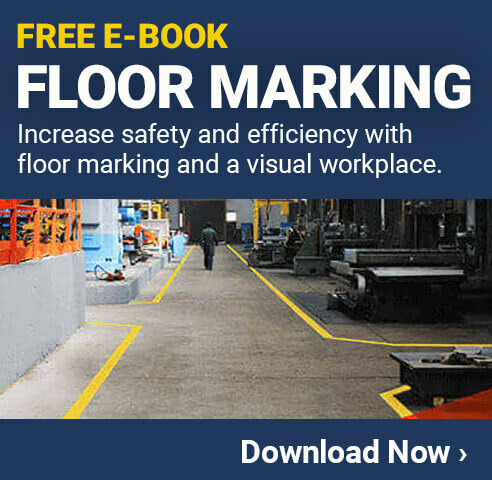 This will help ensure the floor markings are not only effective, but also in line with OSHA and other types of regulations. There are two main categories of floor marking options to choose from. Floor marking tape and floor marking paint. Both can be very effective, as long as they are used properly. Within each of these two categories, there are many types to pick from, each offering a variety of benefits. When facilities take the time to weigh out all the options, it can be quite easy to choose the right floor marking for a given situation. Floor marking tape is extremely common in manufacturing, warehouse, and retail locations. When applied properly, it can remain in place and provide excellent visibility for years. This type of floor marking is great for both large areas and small. Most commonly people will see floor marking tape used as aisle markings. These markings help drivers of high-lows, as well as pedestrians walking in the area, know where the edge of the aisle is located. In addition to this type of long, straight path, facilities can also use floor marking tape for smaller areas and even around corners. One of the many things that makes floor marking tape a great option for almost all situations is that there are so many types of tape to choose from. This can help facilities ensure they always have exactly what is needed to convey the right message. Floor marking tape can be purchased in a wide range of colors. Having several color options in a facility provides important benefits. 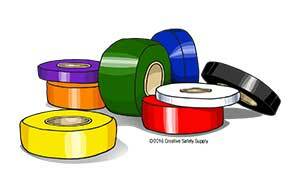 For example, a facility could put down red floor marking tapes in an area where there is a heat-related hazard, reminding employees that they should wear personal protective equipment when entering that area. Having the right colors in the right situations can also help a facility remain in compliance with certain OSHA color marking standards. In addition to colors, floor marking tape can have different designs printed onto the tape itself. Facilities commonly use black and yellow stripes on floor marking tape, for example, to convey the message that people in this area need to use caution. In areas where a facility needs designs on their floor markings, floor tape is the ideal choice. While it is technically possible to have detailed designs using floor marking paint, it is much more difficult to implement. With tape, a facility simply orders the design they desire and then applies it as normal. Many people worry that floor marking tape won't stand up to heavy-duty work areas. When high-lows drive over it, forklifts scrape it, and people walking on it, there is some reason for concern. When a company chooses the right type of tape for the environment, though, the tape can easily stand up to anything thrown at it. Floor markings are of no use to anyone if they can't be seen. In most situations, brightly colored floor marking tape is sufficiently visible from anywhere in the area. For many facilities, however, there are areas where there is not sufficient light to make the floor markings visible. In other facilities, the lights are turned down in the evenings making things harder to see. There are certain types of floor marking tape made for these exact situations. Glow-in the-dark floor marking tape, for example, absorbs light when it is available and then glows when it isn't. This helps everyone in the facility see the tape no matter how bright or dark it might be. Another good option is reflective floor marking tape. By adding a reflective surface to the tape itself, people will be able to see it whenever a light is shined. Drivers of indoor vehicles, for example, will have their headlights on when it is dark in the facility. The light will be reflected back toward the driver by the tape, helping them see exactly where they are going. Floor marking tape doesn't just have to be in long straight lines. There are also many types of floor marking shapes made out of this tape. These shapes can convey very specific messages and help make the tape even more useful. Tape shaped like a footprint, for example, can be used to designate a walking path. Corner pieces can make it much easier to use floor marking tape for aisles or other similar areas. It is also possible to have letters made from floor marking tape, which allow facilities to convey very specific messages that people will see every time they walk or drive by. Floor marking tape is also a very affordable way to create a visual communication system in a facility. Many companies have found that when they factor in the time and effort required to install floor markings, tape is the clear winner in terms of overall cost. This is because one person can install it, and it doesn't require any work stoppage during the installation process. Overall, this tape is almost always the most affordable floor marking option for just about every type of facility. The other main category of floor markings is floor marking paint. This is a durable paint that is applied directly to the floor of the facility. Using paint rather than tape can make it easier to go around corners or apply the paint into tight places. Floor marking paint is a very popular choice in many areas and can be used to effectively convey almost any type of message. When applying floor marking paint, it is important to make an effort to keep it neat. If the paint is not applied with crisp edges, it may be more difficult to see and understand from a distance. Using outlines is a great option for making sure the paint is applied exactly where it needs to be and nowhere else. One of the most common places where paint is used is on the public roads. Roads have straight lines for the lanes, arrows, words, and more. This same strategy is often used in facilities to clearly convey a message. Another thing to remember is that floor marking paint takes time to apply and dry before anyone comes in contact with it. Unlike tape, which can be walked on immediately, paint should be allowed to dry at least overnight to avoid having it streak or get spread over the facility. Once the paint is dry, however, it can stay in place for years without any significant issues. One of the biggest advantages of using floor marking paint is that it is very easy to get paint in any color a facility needs. There are many colors of floor tape available, and it can technically be special ordered in any color, but paint colors can be made in just moments. For companies that want to have a variety of colors or who want to have colors that match their own corporate image, this is something to consider. While floor marking paint can certainly be useful in many situations, it isn't the best option for every location. When a forklift drags its fork against paint, for example, it can chip away, making it more difficult to see over time. 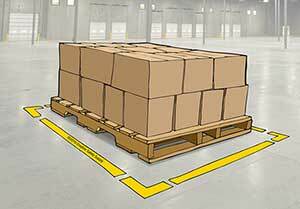 With the right floor marking tape, forklifts glide right over it without any trouble. As mentioned above, paint also takes significantly longer to apply. In some areas, it can take 12 or more hours before it is completely dry, which may mean it will require an extended work stoppage every time the paint needs to be reapplied. Paint is also much more difficult to remove from the floor. If a company wants to make adjustments to its floor marking strategy, it is often necessary to use harsh chemicals to get the paint off the floor. The facility may need to close while this work is done. Floor marking tape, on the other hand, can be pulled up quickly and easily with the right tools. Virtual floor markings are another option. The most common type of virtual floor marking uses a light or laser projector to create an image on the floor. While virtual floor markings are not nearly as popular as floor marking tape or paint, they can be extremely helpful in certain situations. Temporary - This method does not put any long-term markings on the floor, which makes it a good option for conveying messages that may change over time. Highly Visible - High-quality virtual floor markings can be seen extremely well, especially in the dark. Adjustable - Facilities can adjust the image displayed with virtual floor markings. This includes changing the design, color, and size. Keeping floor markings clean and visible is very important for ensuring they last a long time. Both floor marking tape and floor marking paint can be cleaned in the same way that the maintenance team cleans the rest of the floor. 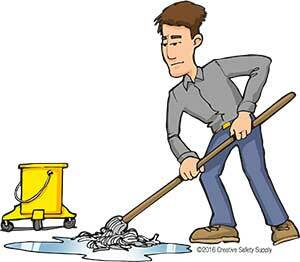 Using mops or even cleaning machines will keep dust, oil, grease, and other things from building up over the markings, making them difficult to see. Of course, both paint and floor tape will wear out eventually. When this happens, it is important to reapply the paint or replace a section of tape to avoid further problems. If tape starts peeling up, it can quickly spread to other areas. Have the maintenance team keep an eye on the condition of all floor markings. Of course, virtual floor markings don't require any type of cleaning since there are lights projected onto the floor or other surface. No matter what type of floor marking a facility chooses, the most important thing a company needs to do is provide training to their employees about what the markings mean. This should include everything from the meanings of each color chosen and what different shapes or patterns mean to how to properly keep the floor markings in good condition. In addition to having new employees trained on the meaning of floor markings, all employees should be given updated training as often as it is needed. This may be annual refresher courses or update courses whenever changes are made. When done properly, floor markings can dramatically improve safety and efficiency in any type of company.